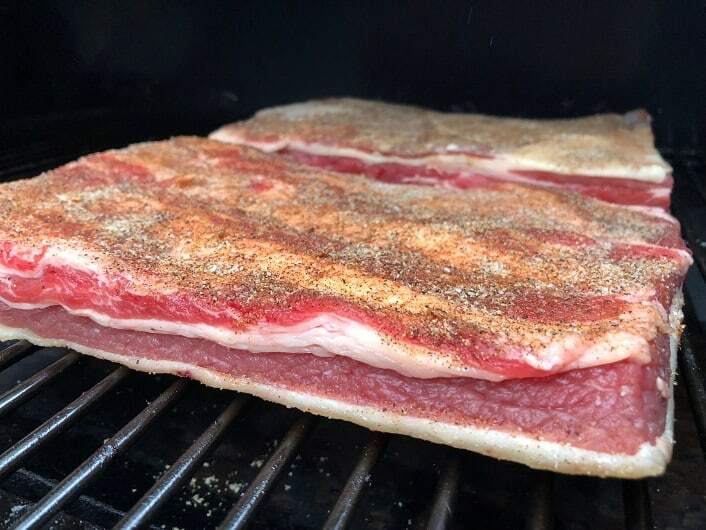 Beef Belly: Four Ways to Smoke this Beast of a Cut (Including Bacon)! My local butcher happened to have a 12 pound beef belly on hand the other day and there was no other option than it coming home with me. I spent some time pondering what to do with this massive pile of beef and decided to cut it into four sections and have a little fun! 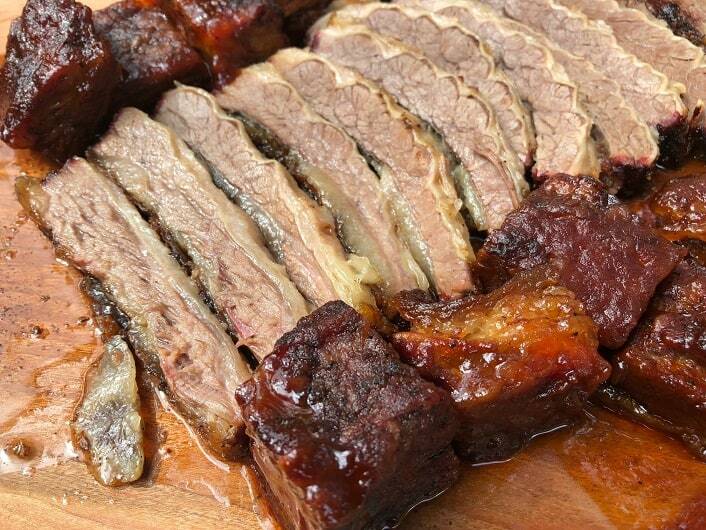 Let’s take a look at how to use a beef belly to make some seriously great barbecue! The brisket and belly on a steer share a lot in common. They have great fat content, are located next to each other and benefit from a long slow cook. I figured it kind of made sense to try treating the belly like a brisket and see how it did! I seasoned two of the belly slabs with a brisket rub and put them on the smoker with some hickory at 250F. After four hours the bellies reached an internal temperature of 185F. 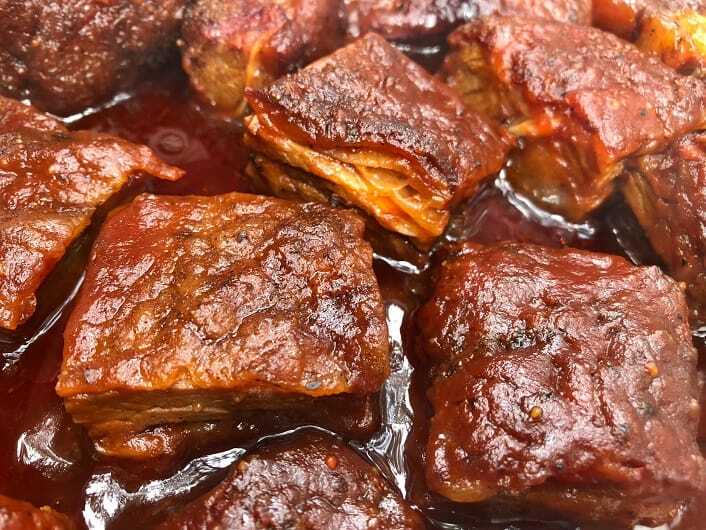 I took one of the bellies off, sliced it into one inch cubes and tossed them in a foil pan with some Head Country Hot barbecue sauce. This was covered and returned to the smoker for another hour to make some beef belly burnt ends. The other belly stayed on the pit until it was probe tender, about another two hours. The belly had reached an internal temp of about 203F at that point. The second belly was rested, sliced and served along with the burnt ends to make a pretty awesome “brisket style” platter. Oh yeah! If you have a beef belly then you are morally obligated to make Beef Bacon. 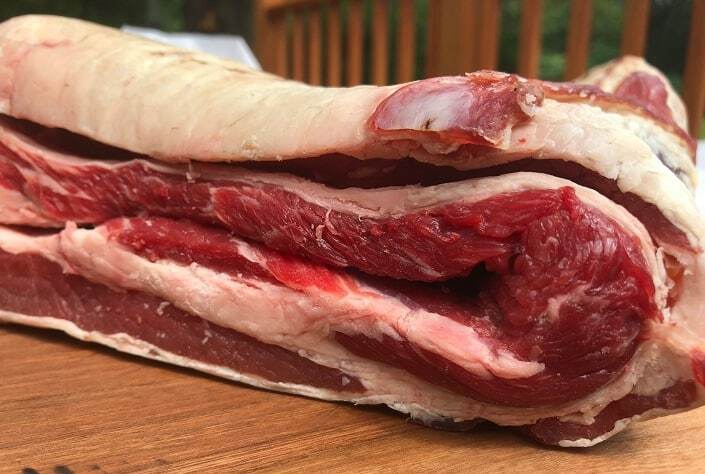 Pork bacon comes from the pork belly so making beef bacon from the belly of a steer just makes sense. Making bacon is pretty simple. Evenly coat the belly with Morton Tenderquick at a rate of 1 Tablespoon per pound of meat. Place the meat in a Ziplock bag and then into the refrigerator. Let the belly cure for five days and flip it once a day to let the moisture even out. After the belly has cured rinse off the surface, pat dry with a paper towel and lightly season with black pepper. The belly goes onto the smoker at 250F with some hickory and is smoked until it hits an internal temperature of 150F. Pull the belly from the smoker and allow to cool in the refrigerator before slicing. The texture, melting point, flavor and amount of the fat on beef bacon is very different than pork bacon. Since they are so different I end up treating them different. I typically slice beef bacon pretty thick and either bake it at 350F until crispy or dice it into chunks to use as a secret weapon in a pot of pinto beans. 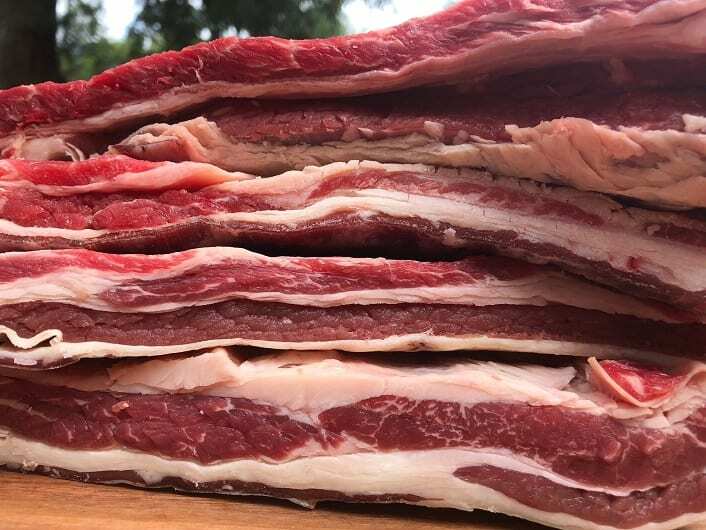 If you want to try some awesome beef bacon but can’t find a belly then here is a link to buy some from the folks over at Porter Road. They have great beef. 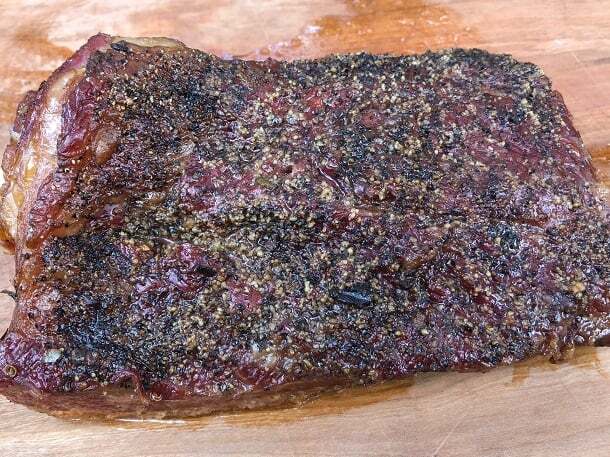 Making pastrami is another classic use of the beef belly. While pastrami is usually made from brisket there are some folks that claim some of the famous New York delis actually use the belly. 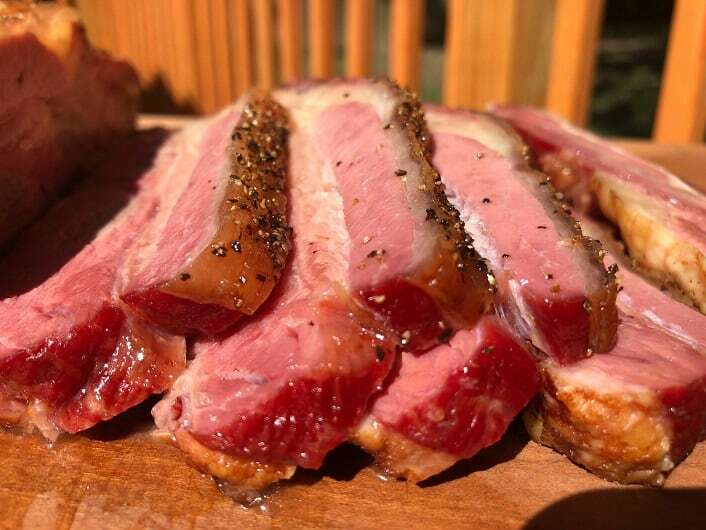 Making pastrami is just as easy as making bacon. Soak the belly in a pickling cure brine for a week in the refrigerator. 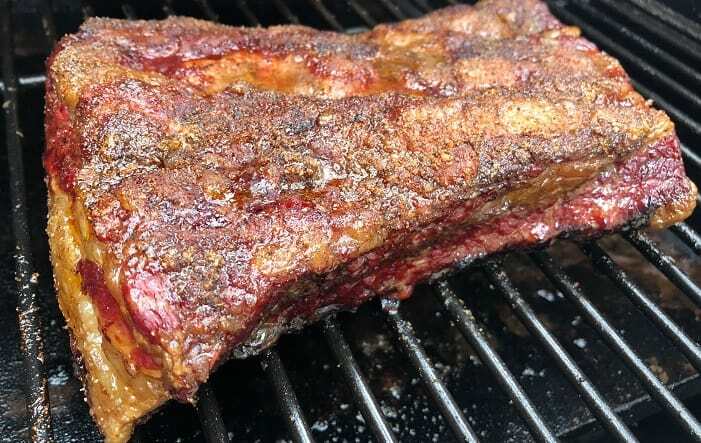 After the belly has cured in the brine rinse the surface with cold water, pat dry with paper towels and rub the surface with black pepper and coriander. 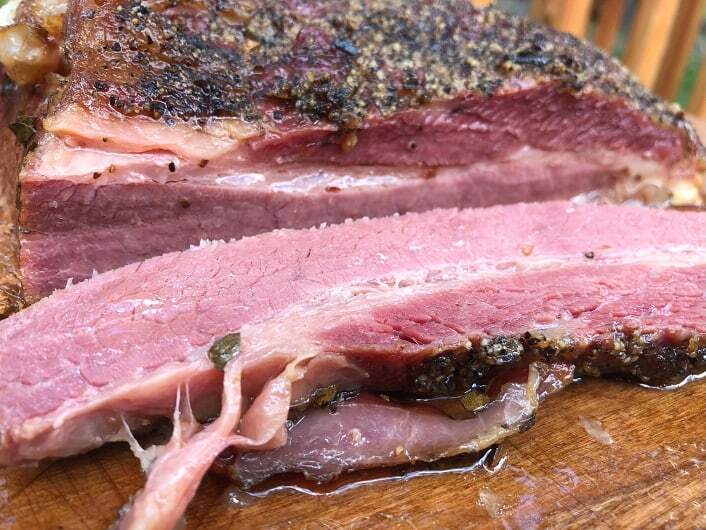 I smoked this pastrami at 250F with hickory for four hours then wrapped it in aluminum foil and cooked it for another two hours until it was butter tender. This guy was so tender it almost fell apart when I took it out of the foil. This was one of those cuts that got the “jiggles and wiggles” every time I hit it with my knife. What can I say? The pastrami was amazing. Yes, I know that there are probably 15 sacred rules about pastrami that I just broke. Don’t care. 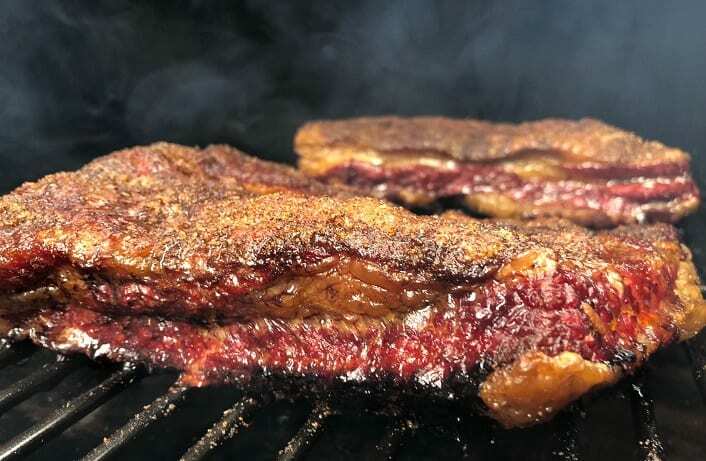 I had a blast trying out a bunch of ways of smoking a beef belly but if I ever find another one then I am turning the entire thing into pastrami. Turing it into bacon and cooking it like a brisket were fine ways of using this cut but the pastrami was freaking divine! You are not going to find this cut in your local Wal Mart so head over to a real butcher shop and ask them to hook you up. Want to advertise, work together or give me a hard time? You can reach me at [email protected]s.com.